Home Music How Monday Became the Best Night to See Live Music in L.A.
How Monday Became the Best Night to See Live Music in L.A.
There’s a buzz of excitement in the line outside the Echo, the popular music club on Sunset in Echo Park. Stylish twentysomethings in hats and scarves chat about their bands or their last auditions. A doorman checks IDs and a security staffer does pat-downs. Each time the club’s heavy door swings open, a burst of guitars and drums tantalizes the growing queue. Inside, a young rock singer-songwriter named Lauren Ruth Ward takes the stage with her four-piece band. Her hair, streaked blue and red, flies as they launch into a song off her debut album, Well Hell, due out next month. Even though the song, “Staff Only,” hasn’t been officially released yet, half the crowd already seems to know all the words. It’s Monday night and, as usual, the Echo is packing them in. In most cities, Monday is a slow night for concerts, but in L.A., it’s bustling with activity. From the Echo, Bootleg, and Satellite to Bardot, the Hotel Cafe, and Harvard & Stone farther west in Hollywood, smaller venues set aside Mondays to showcase up-and-coming local bands, usually without charging a cover. If you’re on a budget but love live music, it’s the best night of the week. The most common format on Mondays is the monthly residency, in which one band (usually local) plays every Monday for the entire month with a rotating cast of support acts. 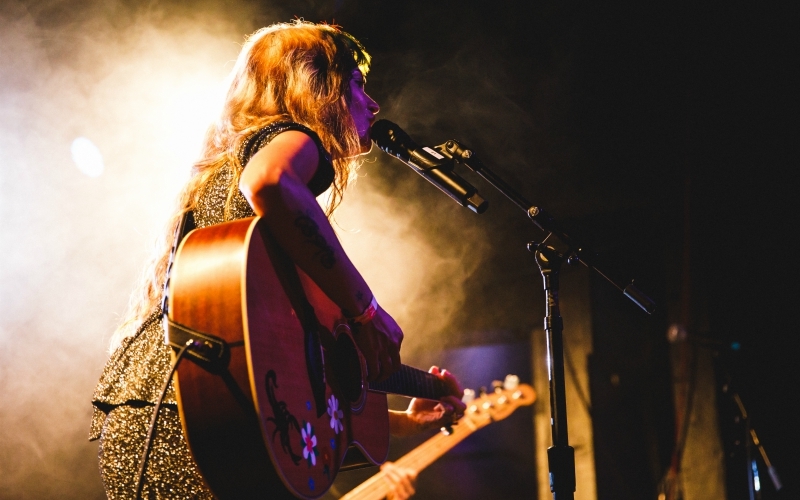 For musicians, residencies are a chance to hone their set list with a steady gig; for venues, they’re a chance to form closer relationships with the local musicians who are the lifeblood of any music scene. “Saying we saw this band early, we believed in them and gave them a residency…it adds to the community,” explains Liz Garo, VP of talent for the Echo’s parent company, Spaceland Presents, which also operates the Regent Theater and the Echo’s larger sister venue, the Echoplex, as well as numerous special events like the Twilight Concert Series on Santa Monica Pier. That creativity is on display at Monday gigs all over town. At Zebulon in Frogtown last August, guitarist William Tyler opened one show with a presentation by an ethnomusicologist. During his January residency at Hotel Cafe, singer-songwriter JP Saxe introduced a poet, Alyesha Wise, as his opening act. At ETA, a tiny cocktail bar in Highland Park, a jazz quartet led by guitarist Jeff Parker of the instrumental rock group Tortoise plays most Monday nights. Garo says the Monday residency tradition in L.A. can be traced back to Club Lingerie, a hotbed for the city’s alternative rock scene in the early ‘90s. When Garo’s boss, Mitchell Frank, opened his first venue, Spaceland, in 1993, he borrowed the concept and it took off from there. “Over the years it became kind of a rite of passage for bands,” says Garo, who followed Frank when he left Spaceland (now the Satellite) and launched the Echo in late 2001. Since then, now well-established artists including Silversun Pickups and Local Natives have gotten an early career boost from a residency at the Echo or Echoplex, and countless other L.A. venues have, at one time or another, launched residency nights of their own (see below for a current list). One notable exception to the monthly residency formula is School Night, which since 2010 has brought a fresh lineup of rising bands (and the occasional high-profile guest) each Monday night to Bardot, an intimate lounge in Hollywood tucked above the lobby of the Avalon nightclub. Founded by Chris Douridas — best-known as one of KCRW’s longest-tenured DJs — and event promoter Matthew Goldman, School Night has become widely regarded as the best weekly showcase of new talent in the entire L.A. music scene, a place where fortunate fans caught such future stars as Father John Misty, Gary Clark Jr. and HAIM before they went on to headline festival stages. At a recent School Night, the Spencer Lee Band, a nine-piece group with a soulful Southern rock vibe, led by a charismatic singer-guitarist from Kansas, packed the tiny stage in Bardot’s main room, making the crowd sway to their loose-limbed grooves. A large VR camera captured their every move; School Night will soon be getting its own channel through a virtual reality network called NextVR. “We want to get these bands in front of as many people as possible,” says Goldman. Here are just some of the venues where you can typically go to hear free live music on Mondays. Some have monthly residencies on Tuesdays and/or Wednesdays, as well. Check venue websites to confirm before going. The Bootleg Theater, 2220 Beverly Blvd., Echo Park. (213) 389-3856, bootlegtheater.org. The Echo and Echoplex, 1822 Sunset Blvd. and 1154 Glendale Blvd., Echo Park. (213) 413-8200, spacelandpresents.com. ETA, 5630 N. Figueroa St., Highland Park. (323) 274-4755, etahlp.com. Harvard & Stone, 5221 Hollywood Blvd., East Hollywood. (747) 231-0699, harvardandstone.com. Hotel Cafe, 1623 N. Cahuenga Blvd., Hollywood. (323) 461-2040, hotelcafe.com. The Satellite, 1717 Silver Lake Blvd., Silver Lake. thesatellitela.com. School Night at Bardot, 1737 Vine St., Hollywood. (323) 462-8900, itsaschoolnight.com. Zebulon, 2478 Fletcher Drive, Elysian Valley. (323) 663-6875, zebulon.la.